That UK sun must be doing something good for you. Your hair looks bouncy and a nice black sheen to it although not shiny. You are well on your way!!!! Its a journey, no worries, right! How long is your retights? You're doing really well. At 3 months, I had 1/4 the length you have. Liking the "tucked behind the ear move" - brax! Looking good girl. 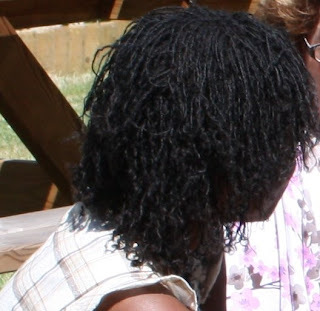 Did you combine those locs that were causing grief? What tool d'you have? Can we see it? Wow, your locs are looking great!